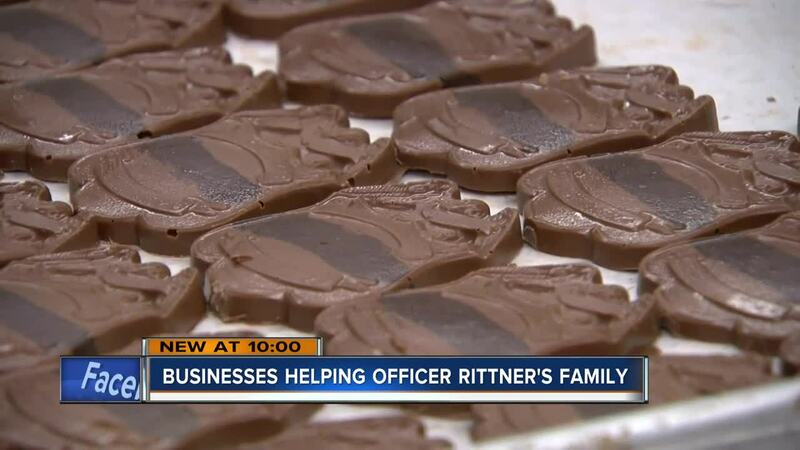 Local businesses raise funds to honor the late Milwaukee officer Matthew Rittner. Customers have been buying them by the handful, sweet hand made chocolates in the shape of a police badge. "It's been overwhelming. We have had a lot of people that have come in and purchased these," said Pat Murphy, owner of Ultimate Confections. Murphy said when he heard the news that Milwaukee lost another police officer in the line of duty, he had to find a way to help. "It was devastating news. It was sad and made us angry. This has gone on long enough. This nonsense and I just felt like I wanted to do something," said Murphy. The chocolate shop owner decided to sell chocolate police badges with all the proceeds going to the Milwaukee Police Association Fallen Heroes fund. Other businesses have also stepped up to show their support for the police department. The Packing House is hosting a fundraiser on Friday, February 22. Ten percent of the proceeds sold will go to the family of Officer Rittner. "We have to do what we can for them when the time is needed," said Executive Chef Marie Schroeder. Both businesses hope in some small way their gestures of support will bring comfort to the police department and the family of Officer Rittner during this tragic time.